Posted 26 March 2018 in Interview. 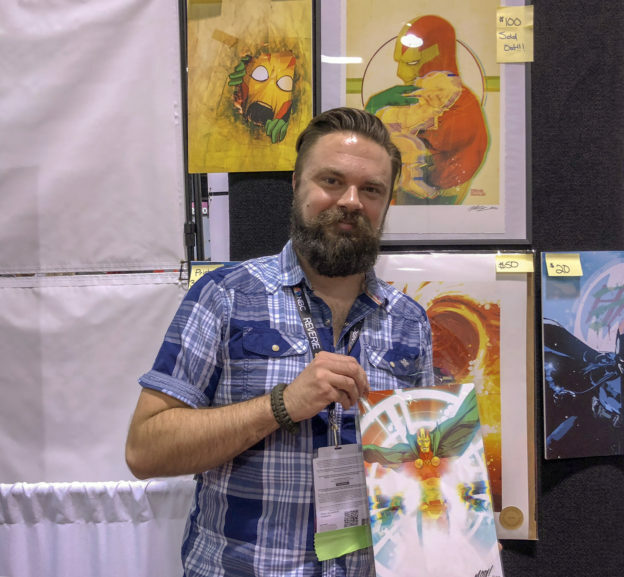 This interview was conducted on March 24th 2018 at WonderCon 2018 in Anaheim, California by Tom Kraft at Mitch Gerads’ booth, exclusively for the Jack Kirby Museum. Mitch Gerads is the artist of the popular and highly acclaimed comic series, Mister Miracle, based on Jack Kirby’s original characters of his Mister Miracle series. Written by Tom King, this 12-issue series is currently on issue 7 at the time of this interview. Kirby Museum: Can you tell me your background, how you started, where you went to school, just a general idea. Mitch Gerads: Yeah. I kind of have that… I’ve been lucky enough in my career where I have that story of, I’ve wanted to be a comic book artist since I was four years old and it worked out, which is awesome. The road there wasn’t always straight there by any means. I always wanted to be a comic book artist, but somewhere in my senior year of high school, I had the cognizance enough where I realized how hard it was to get in the industry and I was very excited to start my new life path of college and being on my own and all these things that I was excited about, so I went with graphic design. I was like, “All right, I can still do art, but it brings me on a more solid career path.” I went to school for graphic design. I did a four year, it took me five, Bachelor of Fine Arts, and then I immediately got hired at a design firm where we did packaging for Trix and Lucky Charms and all the General Mills kind of kid cereals. Actually, I got hired as a colorist over at Boom! for a while. Then I did a couple issues of “Dr. Who” over at IDW. Then that brought me right to the “The Activity” at Image, and then from “The Activity,” we went to “Punisher” for 20 issues, and then right after “Punisher,” “Sheriff of Babylon” and “Batman,” and “Mister Miracle,” and here we are. KM: What city was that? Where were you? Gerads: I lived in Minnesota. I’ve lived in Minnesota the first 34 years of my life, and now I live in Phoenix. KM: Phoenix where it’s hot. Gerads: Yeah, it’s the exact polar opposite. KM: When you started out, you were doing physical drawing and ink? Gerads: I was traditional all the way up until about halfway through “Punisher,” so 2012, then I switched to all digital. KM: What made you switch? Why did you decide to? Gerads: Yeah, my path there is different than everyone else’s. The reason I switched is actually, I would be in my studio and I’d be working all day long, and then my wife would come home and we would talk and say hi, but then I would go back to my studio and she would go watch TV in the other room, and we didn’t see each other all that much until I went to bed and it kind of bugged me, it kind of weighed on her a little, so then I discovered the Cintiq Companion, it’s a Cintiq but it’s a standalone computer so you can travel with it and go anywhere. I started… I looked into that and I got it, but I still wasn’t happy with how my art looked on it. It looked too fake, it looked too digital. I actually had the technology for about a year and a half until I decided to go all digital. I wanted to wait until my all digital stuff looked like it was traditional. I finally figured that out with the help of the Kyle Webster brushes, and I think I achieved that, and digital has helped me really enjoy my art. KM: Do you do your art on an iPad or do you still do it on the big display? Gerads: I still do it on the … I enjoy the 13 inch screen, which is weird. I do it on the 13 inch MobileStudio Pro. It’s their new advanced version of the companion. KM: Was Jack Kirby an influence in the direction of your art? Gerads: Yeah, I mean in a lot of non-obvious ways. He’s Jack Kirby, how can you not be influenced by him and be in comics? Obviously, I think everyone is inspired by Kirby in the dynamic poses and all these things, but I knew I didn’t necessarily want to do straight up Kirby. I didn’t want to do that version of super hero comics. I kind of found a niche where I really enjoy bringing humanity and… realism is kind of a dicey word, because people get caught up in it, but I guess realism to kind of these super Kirbyesque characters. 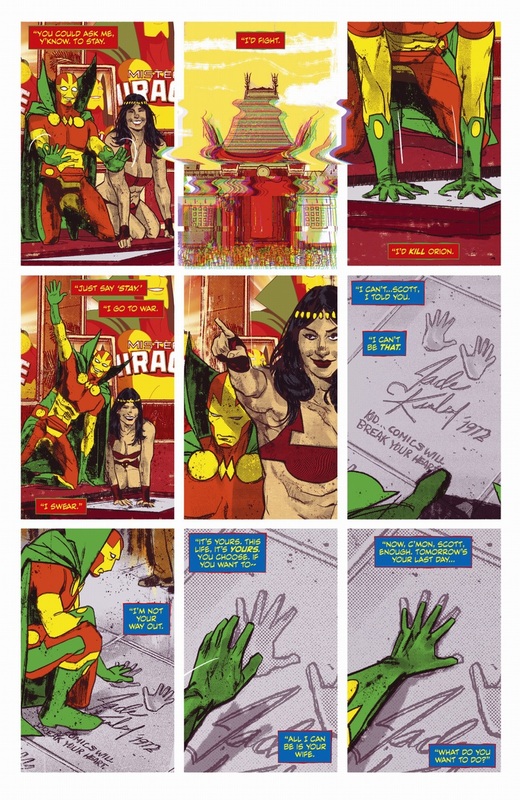 I think that’s been kind of… especially “Mister Miracle,” it’s about humanizing gods. Yeah, that’s kind of been my approach, but I mean Kirby, especially working on “Mister Miracle,” it’s never not in my head. He’s ever present. Gerads: I was just finishing up “Punisher” and Jamie Rich, who was the new head guy of Vertigo at the time, called me up and he’s like, “Hey, can I pitch you some things?” I was like… and Marvel had not really found me anything yet. I was like, “Yeah, I’ll listen to what you got.” He pitched me a couple things, but then all of a sudden the next pitch was, “All right, it’s kind of like “Justified” meets “Homeland,” and I’m like, “Yeah, I’m in.” He’s like, “All right, well, it’s written by Tom King.” I’m like, “Super in.” I was familiar with Tom from his novel, “A Once Crowded Sky,” and then also he was on “Grayson” at the time. They had me try out. They gave me a couple characters from “Sheriff of Babylon” and were like, “Hey, how would you interpret these?” One of the directives on it was the character Sofia. They’re like, “Oh, Sofia, sitting on a couch holding a tea cup.” So I drew that, and what I found out a while later, Tom telling me of one of the reasons I stood out, because they had tried out a few people on the book and he just wasn’t happy, and one of the reasons I stood out I guess is that I was the only artist of everyone who tried out that actually drew an Iraqi tea cup. Everyone else drew an English tea cup and there’s a difference, so he liked that I cared. That kind of started our whole relationship and right from the beginning, Tom and I started talking and realized we were on the same wavelength. We’re brothers. KM: Probably your approach to realism made the tea cup realistic, is what got you the job. KM: Can you tell me how you got the Mister Miracle assignment with Tom King? Tom called me up and he told me the news and I was bummed. I was super bummed. All I wanted to do was Batman. He’s like, “What could we pitch?” I’m like, “I don’t know. All I want is that Batman project. The only other thing I care about is “Mister Miracle.” The line kind of went dead, and he’s like “What are you talking about?” I’m like, “You know, “Mister Miracle,” the kid that Jack Kirby…” He’s like “I know who it is. That’s literally who I’m calling to pitch you right now.” Of all the characters and everything, it was really cool that it kind of happened so natural. I think that excited us both and really kind of made us “Oh, we want to make this something special, not just our next superhero thing, but something that…” I mean, we say this all the time and we mean it, is we want “Mister Miracle,” our aim is the next “Dark Knight Returns,” the next “Watchmen.” I’m sure we can’t attain that, but that’s our goal. KM: You mentioned yesterday about growing up with Jack Kirby’s “Mister Miracle” comics. Gerads: Absolutely. My brother, Greg, he was super into comics and he’s 14 years older than me. I have two brothers, 14 and 15 years older than me. Both super into comics and once I got to a good reading age, they would kind of hand me things and get me excited. One of my most memorable things is “Mister Miracle.” I think the first stuff he actually handed me was the Marshall Rogers run and then that brought me to the Jack Kirby run afterwards. I was just fascinated by it. It’s funny, all the themes that I was fascinated by when I was a kid reading those books are themes in our book where I really grabbed on to Scott Free because he’s the only New God, he’s a god that doesn’t want to be a god. He’s the reader’s way into the New Gods, because everyone else is pretty un-relatable. They’re all big gods, they love being gods, they’re all mighty, and Scott’s the guy who just wants to be like a Suburban dude. That’s kind of the reader’s access to the world. KM: In the way you approach your art, is there anything in your approach you can describe in drawing Scott Free, Orion, Big Barda, especially Big Barda, she’s like… such a normal woman. Gerads: Yep. Big Barda in “Mister Miracle” was fun. I’m really glad fans accepted it so quick, because in the past, there really hasn’t… most people don’t draw size difference. That always bugged me. Her name is Big Barda. If you don’t make her big, then what’s the point? So I put a good foot and a half difference. If Scott… if all the DC handbooks say Scott is six one. I think it says, like my Barda’s like seven something, maybe even close to eight. I’m just like, that’s genius, like that’s… not that’s genius. I’m calling myself a genius. Oh my god. To me, it just adds more fun and more… in a way it makes everyone more relatable. Any time you can add traits to characters and make them more relatable and human, I’ll take that all day long. KM: The pacing of the book, what is the process when Tom writes a script? Do you know all the issues, if there’s 8, 9, 10, 11, 12, remaining, are they all laid out for you ahead of time? Gerads: No. That’s a good question, because I specifically have told Tom that I never want to know the future past whatever script I have, just because I don’t want my foreknowledge to seep into the book, because the whole book is a journey and I don’t want to influence readers. I want to be right there with them. So I try to keep it on the wraps. KM: When he writes a script how much influence do you have on how the art is laid out? In the Mister Miracle Directors Cut, Tom King’s script was included. it seemed very specific about what panel is what. Gerads: Yeah, that’s how he does it. I request full script. I like to know exactly what people are saying as close as we can and doing because I get real, hoity-toity and artsy about stuff and I feel like there’s a lot you can do with what people are actually saying, even if it’s not what they mean, but just seeing what’s happening, and so I try to really pay attention to those kind of human nuance, so I want all of it. But the cool thing is Tom and I are so collaborative that he gives me a script, and if I need to change something or I think something works better, he just has me do it. He’ll figure it out with dialog later. So we just kind of feed off each other. KM: Then for every book, you do the art digitally, you create panels and do all the coloring. KM: You do literally everything. You just hand off digital files for printing. Gerads: Yep, and for lettering. KM: And lettering is digital as well? KM: Any previews you want fans to know about in the upcoming issues? Gerads: Yeah, Issue 8 is supposed to be out April 11th. I don’t know if that’s true as I’m currently at WonderCon finishing it in my hotel room and it’s March whatever, but I think it might still be. I don’t think I missed the actual print deadline. We did announce there will be a skip month between 9 and 10. I recently had a child and I’m very slowly figuring out my schedule and how to make it work and all these things. What’s super cool is I found out from all the fans here, everyone kind of gets it. I think fans would rather have a higher quality book than just kind of like knocking it out as many people have told me, in 10 years when this trade is sitting on a Barnes and Noble, nobody’s gonna remember if a book was a month late, so… but I have a personal pride in my deadlines. I’ve never missed a print deadline my entire career and I don’t want to ever, and if I do, I want to make sure it’s the only time. I get it. If people have problems with it, I get it, but I thank people for understanding.